Minerals have never occurred in a uniform blanket with the earth's crust. Our Ultimate Mineral Caps contain the mineral extracts from the Majestic Earth Plant Derived Minerals and are in easy to take capsules. 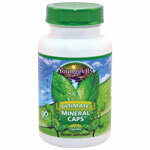 Make sure your body is getting the minerals it needs. Try our Ultimate Mineral Caps today! liquid suspension. Colloids are very small in size and therefore easily absorbed by the cells of the body. Plants convert metallic minerals into this form. Dr. Carey Reams, a well known biophysicist and biochemist, discovered that colloids can get so small they can go through glass. And that even within a colloid there can be a "solar system" of different minerals. They have a natural negative electrical charge. Dr. Reams found that the human body requires 84 of the known 106 elements to maintain optimum health. Which Minerals Are The Best? Dr Wallach: Which Colloidal Minerals are best? Contains: 64 capsules per bottle.